PROVINCETOWN - On a breezy summer morning, when the early light sparkles off the placid harbor waters and nothing moves on the beach but a few scurrying sand crabs, Albert Perry peeks out the open-air window of his small home and burps. Without room for more than a spot to sleep, his home is a bit cramped. But the pleasant view, cool breeze, and soothing sounds of the shifting tides, as well as the lack of rent and the freedom to drink himself to bed, more than make up for the space, he says. "This is home sweet home," said the balding 48-year-old, lifting with one hand the wooden frame that shelters him and revealing his life's possessions: a few musty blankets, a ball of socks, and a collection of empty beer bottles. Nearly every night now, after the tourists have headed home and the late-night partying dies down, Perry and a gaggle of other Provincetown natives sneak onto the public beach on the harbor, swig their last drinks of the night, and slide beneath old, rotting rowboats until morning. "It's more comfortable than a hard floor - and the boat keeps out the rain," said Perry, a sometimes fisherman whose splintering gray rowboat hasn't moved from its sandy perch in years. "The only problem is sometimes kids, drinking or smoking, sit on top of the boat, and I have to yell: `Hey, there's someone sleeping under here, take it somewhere else.'" "I get a good laugh out of it," he added. It may seem like sleeping in a coffin, but Perry and about half a dozen others see the boats as reliable shelter - warm enough, with the right blankets, to stay in through the winter. Without a homeless shelter nearby (the only one on Cape Cod is miles away in Hyannis, and it's almost always full) and with rents rising, sleeping beneath rowboats is their best option - better than the woods, where bugs and rabid animals prowl, they say. The police, who know all the harbor homeless, don't agree. While beachfront businesses and tourists rarely issue complaints, the police sometimes roust the homeless, arresting them for everything from fighting to drinking outside to camping on the beach after hours. In the winter, officers take them into "protective custody" on the coldest nights, forcing them indoors. "We don't and won't look the other way," said Provincetown Police Chief Ted Meyer. "But we're much more tolerant than other places. If we see a guy stumbling around, rather than arresting him, we'll often just let him go home." When home means an overturned rowboat on the beach, however, Meyer insists that officers make them go elsewhere. Yet, in practice, as long as the homeless aren't raising a ruckus, social workers say, the police don't bother them much. And neighbors in this famously liberal town often look the other way. Having worked years ago with some of their fathers as a fisherman, David Perry, a security guard at the Seamen's Bank, sees the homeless people every day. One of the men, Glen, recently brought him a cup of coffee to wish him a happy birthday. "For the most part, these are town boys who've fallen on hard times," said David Perry, who monitors a parking lot off the beach. "They really don't bother people, so unless they accumulate too much stuff, we let them be. I treat them no differently than clients or managers of the bank." One of the few women who sleeps on the beach is Sean Rehill, 52, a gray-haired artist from Greenwich Village. Like the others, she says, she's been homeless here for several years now because she can't afford to pay rent. Sipping a bag-covered beer beneath a wharf, she said: "It's a townie's right to sleep on the beach. It's cool. It's convenient to town and it's not isolated. If you can't find a place to live, you should be allowed to stay on the beach." Another regular here is Gavin, whose rusting metal rowboat lies on a part of the beach where tufts of grass cover the sand. The homeless man, who sometimes passes out with the boat right-side up, has left a few possessions next to the boat: painting supplies, an old outboard motor, and a tattered book titled "Cultural Attitudes in Psychological Perspectives." The group's only regular link to social services is an outreach team from Vinfen Corp., a nonprofit provider of social services on the Cape. Nearly every Friday for six years now, David Gleason, a Vinfen outreach worker, has visited Provincetown's homeless, bringing them gifts such as new underwear, doughnuts, and sunblock lotion. On his first visit to the beach, Gleason said, he didn't see anyone, so before leaving he kicked one of the rowboats to be sure. "Someone underneath lifted it up, and said, `Who's there?' " he said. "I jumped - I was so shocked I spilled my coffee." Now, when he comes, he said, "I just pray I won't find anyone dead under the boat." With cracked ribs from a motorcycle accident and other medical problems resulting from a fight, Albert Perry knows he's on the edge. But the sunburned fisherman, who goes scalloping when he needs money, isn't in a rush to find another home. 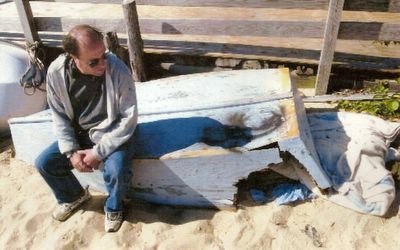 For the past year and a half, he said, he's been living under his battered rowboat, which he says he found when it washed ashore. Looking at a large hole in the stern, which is useful for providing air and a lookout, he says he'll consider searching for another shelter in the winter. "Until then," he said, "this is my home."